Though some people may raise their eyebrows on transparent bathrooms, these ideas are being accepted and considered by a lot of people. 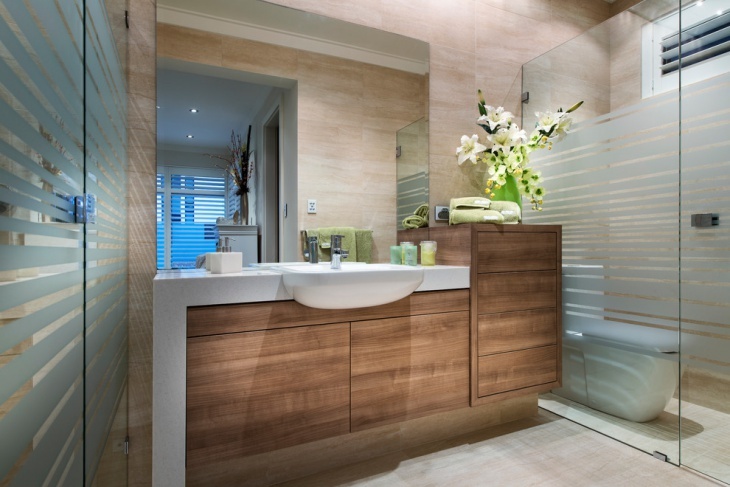 Of course, the best place to have a transparent bathroom is inside the bedroom. Some people though have transparent bathrooms outside the bedrooms. 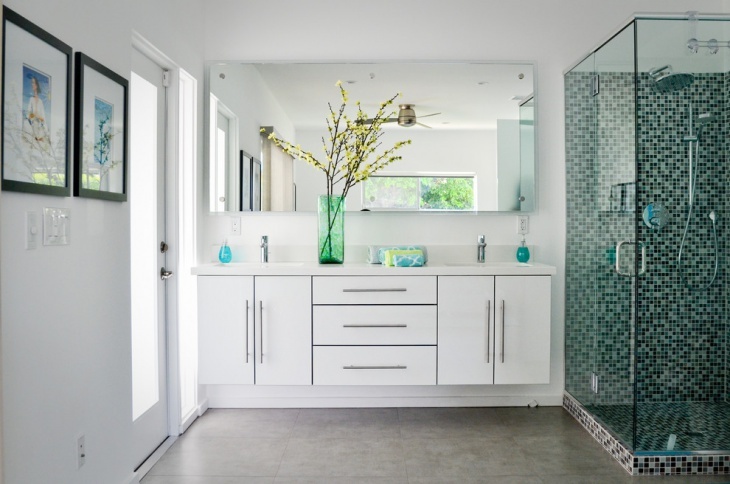 To see how these bathrooms have managed to stay discreet despite being transparent, check out the following transparent bathroom designs. 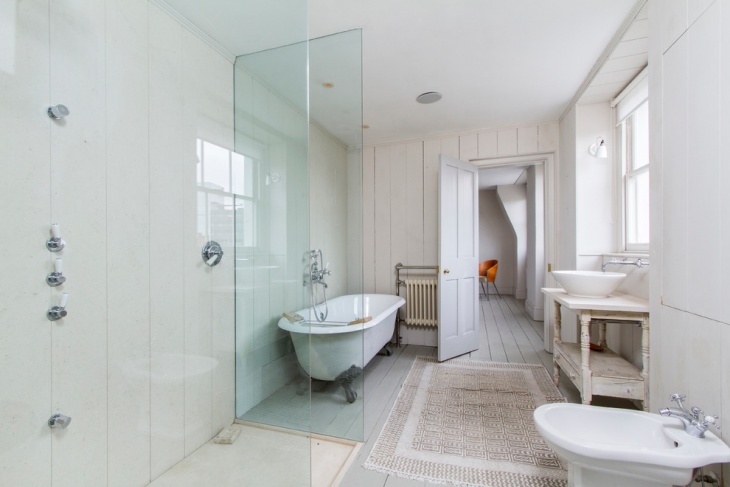 As mentioned above, a bedroom – usually the master’s bedroom – is the best place to have a transparent bathroom. The privacy of the room extends itself to the bathroom. 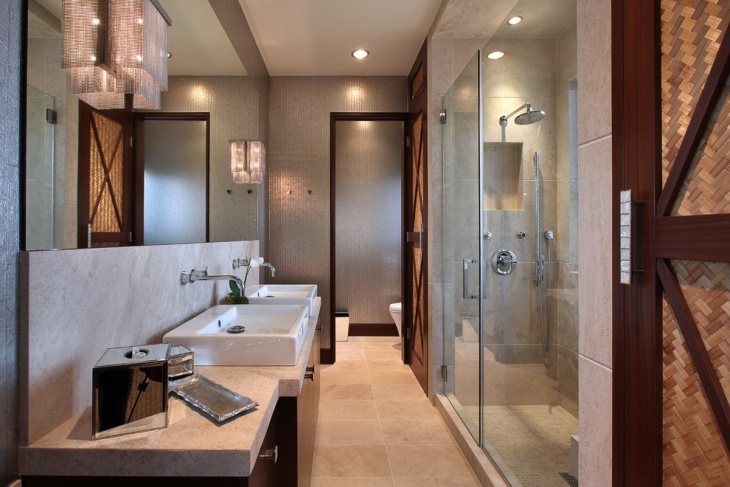 For this particular bathroom, it is installed right inside the bedroom with just glass acting as partition/door. 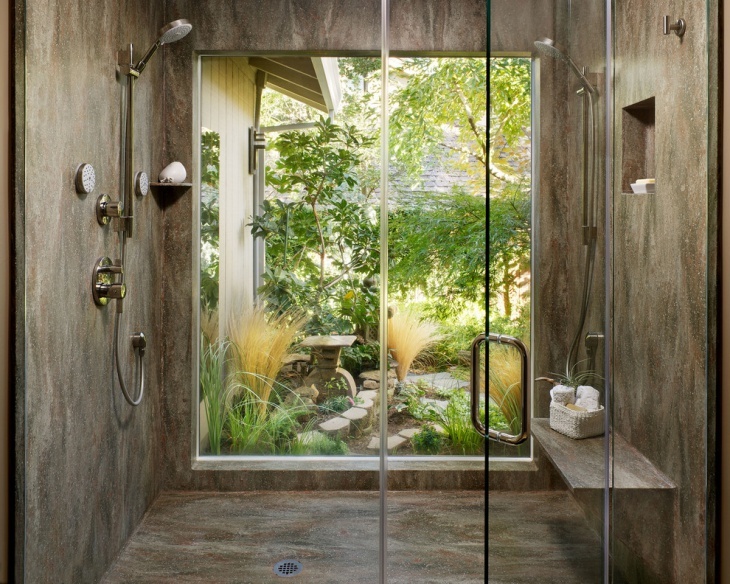 The stone walls provide the rustic appeal, while the glass door and the tall glass window separating the bathroom from the garden truly defines total transparency. 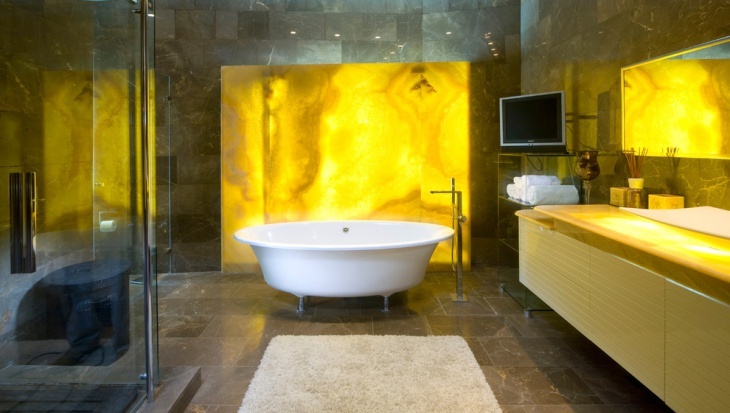 This bathroom is definitely luxurious in so many ways. The two walls are taken over by two vanity mirror and sink top sets. It is in an all-white design that it certainly looks transparent at first glance. 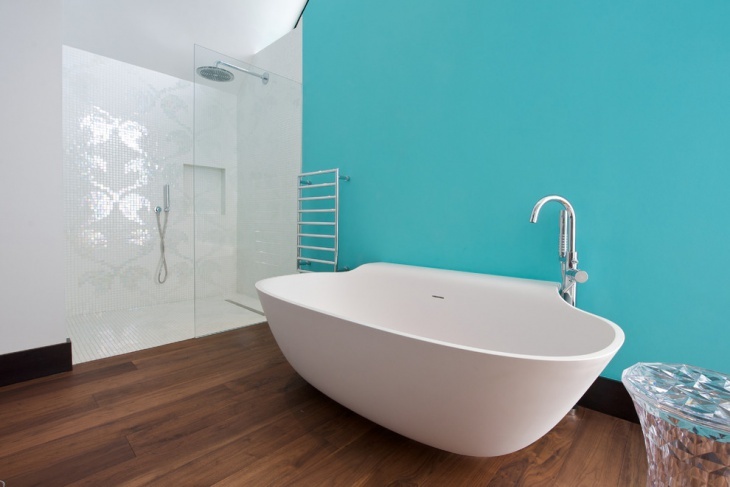 The tub is surely transparent and it is a classic freestanding installed near the semi-circular glass wall. 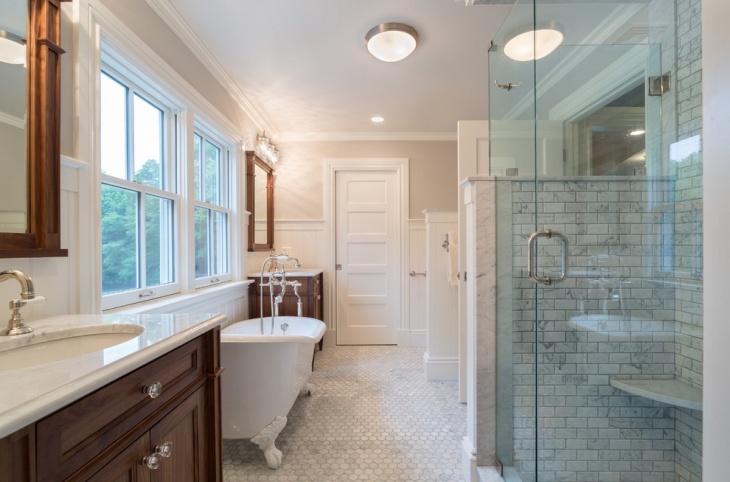 This bathroom may have limited space, but the use of glass partitions – between tub and show and tub and the rest of the room – allows for a great illusion of more space. The sink sitting on a rustic table provides the Victorian look, while the shiplap is a unique addition. This bathroom has a big space, which is emphasized by the white colored ceiling and the light colored non-slip porcelain tile floor. 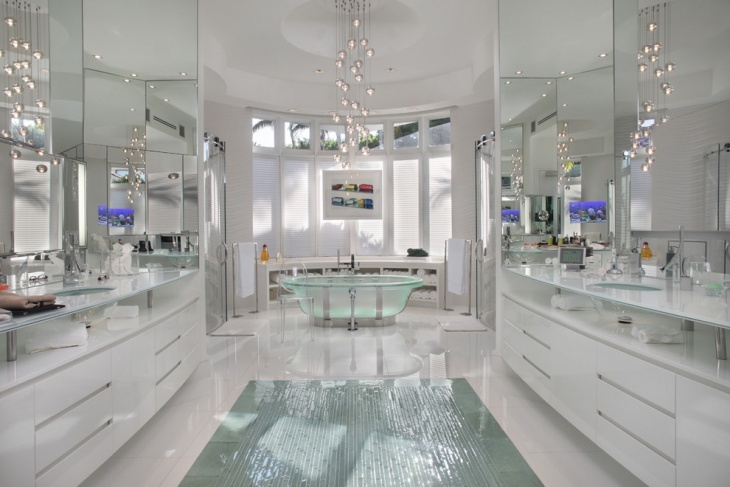 The best part of this bathroom is the glass enclosed shower area, making it totally transparent and cool. 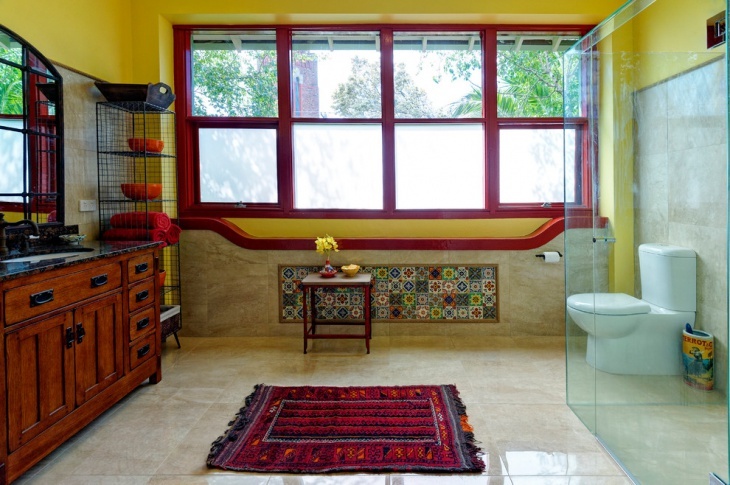 For people who like the colors and excitement of the Mediterranean, this transparent bathroom is a good choice. Yellow walls and ceilings, red-framed glass windows, red towels on the rack, red printed rug at the center, and dark colored cabinet and sink set, these are the features that make this set up truly eye-catching. Black mirrors are classy and chic, making them perfect additions to a feminine room. 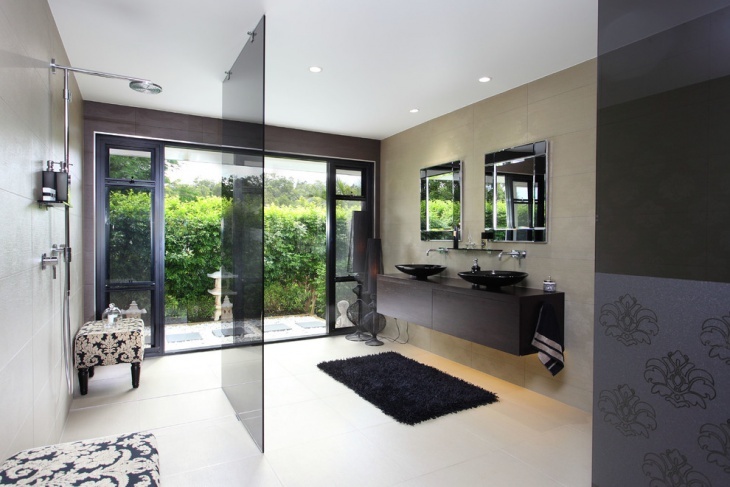 For this bathroom, the black glass idea is used as a partition for the shower area. The glass is attached from ceiling to floor with brackets for both top and bottom, with bottom sealing for additional security. The sliding door leads to a small open space that allows natural light and fresh air. For a long and narrow space, it is a good idea to place the toilet at one end with a dividing wall and door. This allows for privacy and a bit more space for the shower and vanity. With the toilet safely installed separately, the rest of the narrow space is now free. The shower area occupies one side with glass door and partition, while the vanity and sink set to occupy the opposite side. This gray and white bathroom is perfectly placed inside a bedroom with low-key colors. The gray glass that serves as a single partition between bathroom and bedroom, creating a nice and easy transition. The white ceiling and walls of this bathroom create an illusion of space. 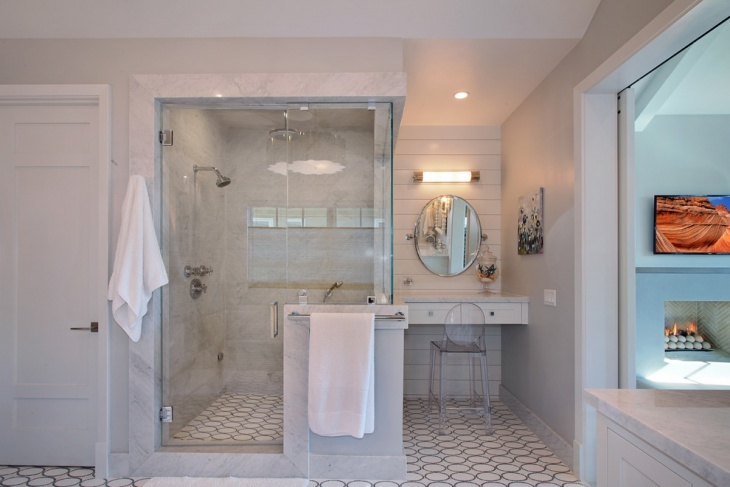 The freestanding tub is ideal for such limited space, and the glass used for the shower enclosure also gives the room a bigger look.